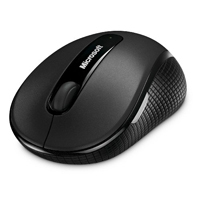 The Microsoft Wireless Laser Mouse 6000 is a contoured wireless mouse with four-way scrolling, instant viewing of your open windows, and a magnifier function to enlarge or edit details on your page. Note: This mouse is not the same as the Microsoft Natural Wireless Laser Mouse 6000, which is discontinued. 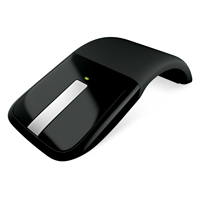 The Microsoft Arc Touch Mouse from Microsoft is an excellent choice for mobile mousing; its flexible design curves for comfort and flattens to pack. When curved, the mouse turns on, and when flattened, the mouse turns off (no button required). To scroll simply touch the scroll pad or flick it for fast vertical scrolling. 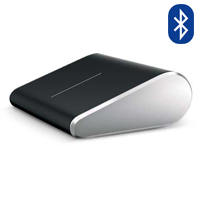 The BlueTrack technology ensures accurate tracking on virtually all surfaces and the convenient 2.4 GHz Nano-Receiver can stow magnetically on back of mouse. For left-handed or right-handed users. La Microsoft Arc Touch Mouse par Microsoft est une un choix excellent pour faire la souris dans les applications mobile; la conceptions est flexible car elle peut être courbée pour le confort, aussi que mis plat pour la ranger. Quand qu'elle est courbée, la souris est activée, et quand qu'elle est mis plat, elle est désactivée (pas de bouton bessoin). Pour faire le défilement, simplement touch le pad de défilement. Pour les usageur(euses) gaucher(ère) ou droitier(ière). 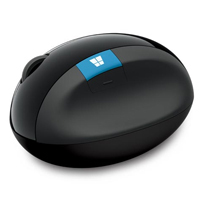 The Microsoft Wireless Mobile Mouse 4000 is a compact and portable wireless mouse using Microsoft's BlueTrack Technology. With a wireless range of up to 30 feet, the Mobile Mouse 4000 has a plug-and-go Nano transceiver for easy storage, reliable 2.4 GHz transmission for almost no interference, Flip 3D in Windows 7 to dynamically open windows with a single click, and a 10-month battery life. 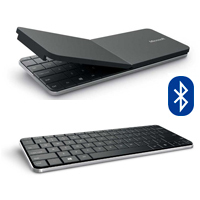 The Wedge Mobile Keyboard was designed for Windows 7 and Windows 8 tablet users who are constantly on the go. (It also works with iPad and most Android devices.) Its thin, lightweight design makes it easy to carry. The durable keyboard cover protects your device from scratches and it also quickly converts into a tablet stand, allowing you to work or watch movies. When you’re done, simply snap the cover back on the keyboard to power it down before you stash it in your bag or backpack This keyboard also has built in some of the most useful commonly used features, such as Windows 8 hotkeys, to give you a quick and convenient way to search, switch between windows, and more. The keyboard also has built-in media keys, making it easy to control music and videos. Work in style and comfort with the new black Microsoft Natural Elite Keyboard. Get easy access to your favourite music, video clips and media programs, and then pump up the volume with the press of a button. 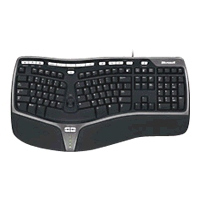 This version of the Microsoft Natural Elite features a 'plus' layout on the arrow keys, and a 2 wide x 3 high arrangement of the Editing Keys, making the entire keyboard slightly narrower than other versions of the Natural. It has a USB connector but comes with a PS/2 adapter. The Sculpt Ergonomic Mouse from Microsoft is intended to encourage more natural hand and wrist postures with an angled body designed to remove the wrist from contact with the mousing surface. The sculpted thumb scoop helps the hand maintain this angled position which is intended to reduce pressure on the carpal tunnel. Windows 8 users can benefit from the clearly marked Windows Logo key which provides quick access to the Start Screen. 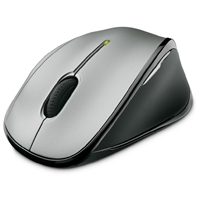 The scroll wheel provides full 4-way scroll control and a convenient Back button is available for quicker navigation. While somewhat similar in design to the discontinued Natural Wireless Laser Mouse 6000, it should be noted that this mouse is smaller in all dimensions than the 6000. While making it easier to transport, by definition it provides less support for most individuals who do not have relatively small hands. One limitation of this mouse is that it is designed to work only with recent versions of Windows (7, RT, & 8). and a driver download is necessary to take advantage of all the features. 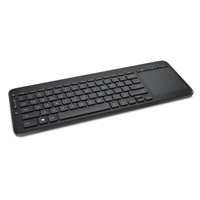 Designed for use in the living room or home theatre, the All-In-One Media wireless keyboard by Microsoft features a standard keyboard layout, but with an integrated touchpad to the right in place of the conventional number pad. The unit can comfortably be supported on the lap, and eliminates the need to juggle between or reach for two separate input devices. The All-In-One Media keyboard features full-size keys, along with customizable hot keys for quick access to music, photos and videos. 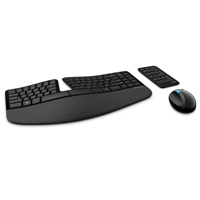 (Note: Customizable keyboard functionality requires Mouse & Keyboard Center software, downloadable from Microsoft's website.) The touchpad features left and right click zones, and a left-click button for easy drag-and-drop operations. The volume control is conveniently positioned along the left edge of the unit. 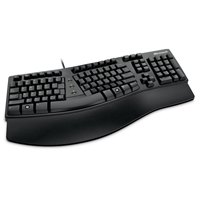 The keyboard connects wirelessly to a PC via a small USB transceiver; it can also work with select USB HID compliant Smart TVs and gaming consoles. (Please refer to product documentation for Smart TVs and gaming consoles to ensure compatibility.) The unit runs on two AAA batteries (supplied) and has an on-off switch to conserve battery life. A matte black finish and durable design help to protect the keyboard from everyday wear and tear in a busy home environment.